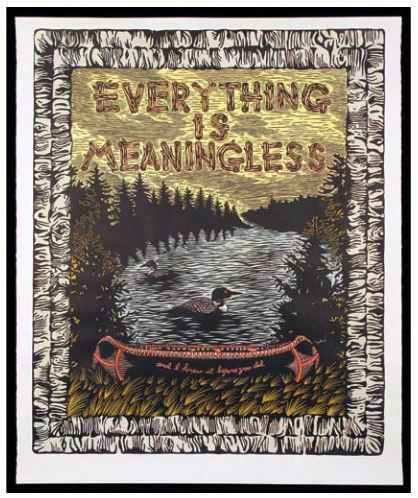 Everything is Meaningless – or is it? I replied, a little casually, “it’s Art!” and promised to tell her more when I see her next. But I wasn’t surprised by her reaction, because I know that running around espousing the belief that Everything is Meaningless is probably going to get me into trouble at some point. Let’s see if I can write my way out of it. First of all, the artist who created the print above is named Patrick Casey. Originally, it was a hand-painted woodcut. Now it’s a print, and I do not know how many of them exist. This one was bought for me by my brother Will and sister-in-law Abigail, and it hangs in my living room. They have the same print in their home in Echo Park. The first time I saw their print I fell instantly in love with it. First, the imagery immediately drew me in. The colors and the texture, the loons and the canoe. Those who know me a little know that my family on my dad’s side came from Wisconsin (Brokaw) and Michigan (Detroit) by way of North Carolina, so this upper Midwestern woods experience runs in my blood. My grandmother’s parents had a little cabin at a place called Payment Lake. It was in the middle of a birch tree forest, with a tiny dock and an equally tiny rowboat to catch sunfish in. There were loons on the lake that cried haunted calls at night. A beaver dam blocked one end. We went there once, when I was about eight. This is the first place I remember ever falling in love with. We caught fish, my great-grandmother cleaned them. We picked wild berries in the woods. My dad showed us how to make a (miniature) birch bark canoe. There was a faded red patterned camp tablecloth, stuck permanently to the table. It was real and perfect and felt like a place in a novel. I have had many days in my life where I do believe fervently that everything is meaningless. Every day, I believe that every THING is meaningless. I have never wanted material possessions to define my life. Yes, I like having nice things and work hard for them. But if you took them all away today, and I still had the love of my family and friends and the ability to write words well, and my people were all OK and not hurt or hungry, that would be fine. I have two strong legs and a brain. I could get from place to place somehow and figure out the rest – where to sleep, what to eat, how to live – day to day. It would be hard, but it could be done. But if Everything is Meaningless, that means that nothing, not my hysterical laughing fits with my dear friends, not the hours of running on the beach, not falling in love, whether for the first time or the third or the next, means a damn thing. Right? This so perfectly defines my parents and it is this pivotal moment that has a lot to do with who I am. Yesterday on my run at 6 a.m. there were two people sleeping on the edge of the Coal Oil Point bluff top in sleeping bags. They looked so peaceful. Their heads were tilted towards each other, and they were fast asleep, out in the open air. The waves were crashing on the beach beneath them. It was a moment. It immediately became a memory. It was everything, it was meaningless, yet it affected me profoundly. For that one second, all I could see was two people trusting each other and the world not to hurt them, and nothing else mattered. Yesterday while I was running in Hope Ranch with my friends after work, I was doing some mental mathematics and realized that I have now been running consistently for 20 years. I started running when I was in junior high school. I had never played a sport ever in my life, was never picked for teams until next to last in Phys. Ed. Running came about because it seemed like it was the only thing I could do that was athletic that didn’t involve jumping, catching, throwing, or bats, balls, water or racquets. Of course, I could have been a swimmer, but that would have involved being in a bathing suit around other kids, and therefore it was simply NOT an option. I can’t tell you how frightened I was to have to go swimming in high school PE. There have been few things in this life that traumatized me more. My parents were runners, simply for the health benefits of a short run (2 miles max) a few times a week. We lived in a pretty place and they were young and athletic, so why not? They’d both run a couple of miles maybe three days a week. I remember being very impressed with my parents about this. I didn’t know many other kids, but I had a feeling that not too many peoples’ parents were out running. Of course, I didn’t start to train consistently until my freshman year of high school, when I joined the track team. I would have just turned 15 that March. I remember feeling like such an imposter when I went to that first track team meeting. All these kids had done sports before, and I literally did not know how to act or what to say. That probably meant I didn’t say much. I remember being traumatized by the whole experience, because they wanted the freshmen to try different track and field events to see what we might be good at and want to compete in. I remember my dad picking me up, and telling him that I just wanted to run and maybe I should quit, because these field events were stupid and I wasn’t going to be any good at them. He encouraged me to go back the next day. And it must have gotten better after that, because I never wanted to quit ever again. So thanks Dad. That was good parenting. It’s a very conservative estimate to say that over my running lifetime I have averaged around 30 miles a week. It’s probably closer to 35. But for the sake of the leaner early years, before I discovered long runs and half-marathons, we’ll say 30 miles a week for 52 weeks a year for 20 years. So that means I have run upwards of 31,000 miles to date. That’s a lot. I figure I can double that before I turn 60. 60,000 miles by 60. Seems like a pretty good goal. Only 40 more years of running to go. For the inside story on the Valley, read Bill’s book, “Sideways in Neverland: Life in the Santa Ynez Valley.” If you’re serious about living here, you need this book – order it today. Bill grew up here. He graduated from Santa Ynez High and UC Santa Barbara, with MBA work at Cal Lutheran. His wife Debra’s Danish grandparents came to Solvang in 1932. His children were born and grew up here; both graduated from UCSB and have Master’s degrees in Journalism (Leah-UCB, Will-USC). He works hard to help clients and the community at large. He cleaned up four miles of Hwy 154 for a year in the Adopt-A-Highway Program, and has served on the boards of the Friends of the Library, Solvang School Education Foundation, and Arts Outreach. 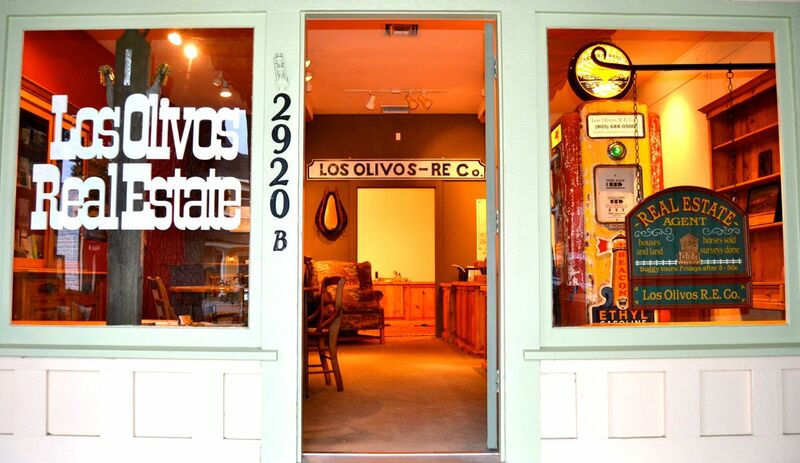 He initiated the projects that banished ugly telephone poles in Los Olivos, Solvang, and on Refugio Road. Bill has built and refurbished numerous homes here over the years. And of course he’s handled many sales for many happy clients. His father-in-law Renton Mitchell was one of the most successful real estate agents in the valley. His mother Marion was the former Director of Nursing at the Lutheran Home, and past president of the Visiting Nurse Association and the Republican Women’s Club. His father Ben is a retired rocket man who worked for AT&T at Vandenberg and played trumpet with the Village Band at Danish Days. His wife Debra runs the Solvang Children’s Shop. The local knowledge you need to make a sound and confident decision is right here. When you choose an agent, you deserve the best. You are committing vast amounts of time and money to your real estate decision. For ability, education and experience, for outstanding local knowledge and tested negotiating skill, and most of all, for peace of mind, call William Etling at (805) 688-0500.